A private or country house, as well as a summer residence, has its own address where letters, notifications and other correspondence will arrive. 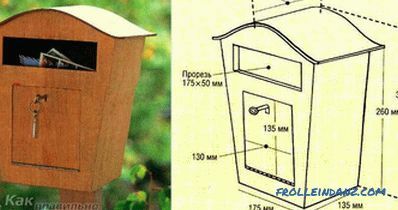 So that it does not spread around the site and is not wet from rain or snow, it is best to equip the mailbox near the gate. You can buy it at the hardware store, but your own model would be the ideal option. You can pick up any material, size, shape and colors. 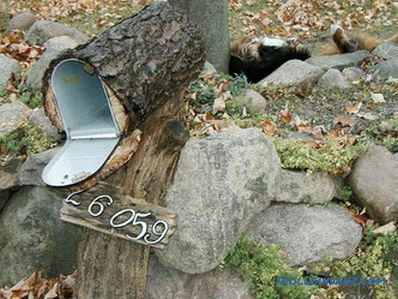 How to make a mailbox with your own hands, we will talk in this article. Detailed designs and step-by-step instructions will help to realize any idea and project. 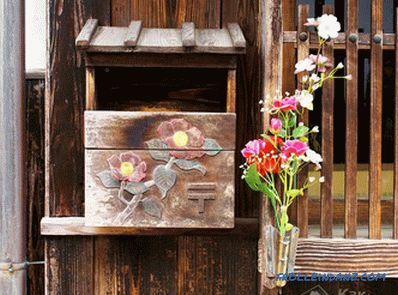 It is very important that the mail box is combined with the general style of the house, as well as the landscape design of the site, and a harmonious picture is obtained. No less important is the parameter such as capacity and the choice of the right place to place. 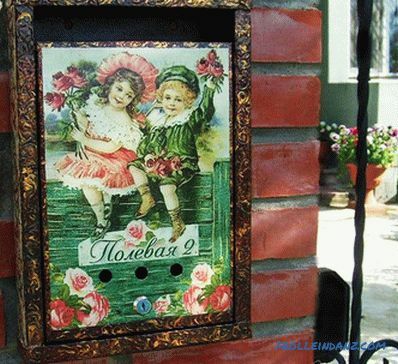 Experts advise to first decide on this issue: the future letterbox will be used exclusively for its intended purpose or additionally be a separate decorative element. In the latter case, his appearance, he will attract the attention of passers-by and friends. Now let's look at the main types of mailboxes, which are divided according to the style of execution. 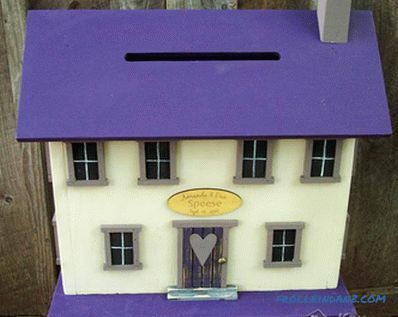 Traditional mailboxes are acquired exclusively for receiving all types of correspondence. 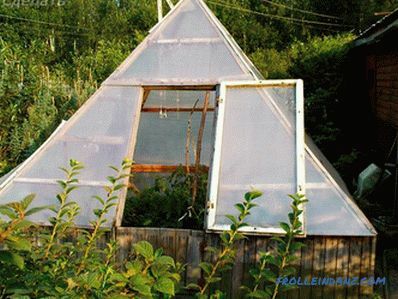 Such species are common in post-Soviet countries and can be made from a variety of materials. In the modern world, in order to make them more attractive, they are additionally decorated with a variety of objects. They are mounted on the fence as well as on the gate. It should be noted that it is this type that is universal and popular, as it is simple and convenient. American American boxes are the same in design, but different in design. This allows everyone to choose the best option. All mail is left in a horizontal position, so large magazines and newspapers will have to be curtailed. A special difference from other models of boxes is the presence of a special flag. 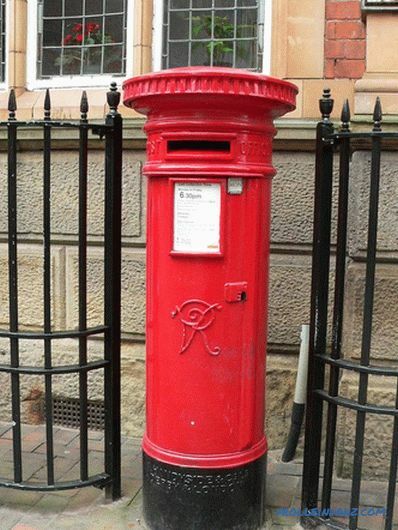 If it is raised, it means that it contains letters to send. 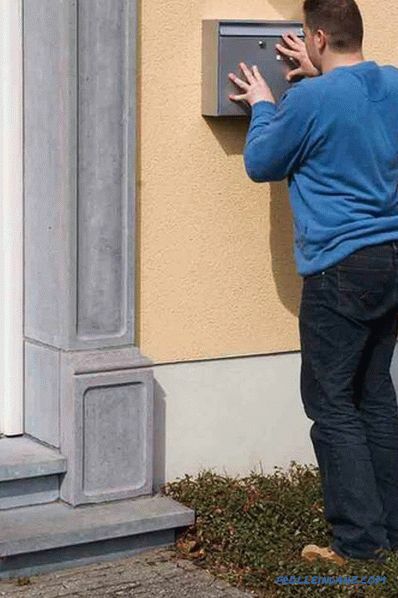 Unlike our rules, in America, postmen retrieve letters and send them themselves via mail. Install the American mailbox should be on a separate support, made of wood or metal, or a decorative figure. The design of the boxes of the English type is a stationary pedestal-table, which is laid out of brick or welded durable metal. Install it directly on the ground, a couple of meters before the entrance to the site. Skillful builders make a copy of the house in miniature, which will harmoniously complement the main building of the estate. These boxes are quite roomy and also very strong, so they will last more than one year. 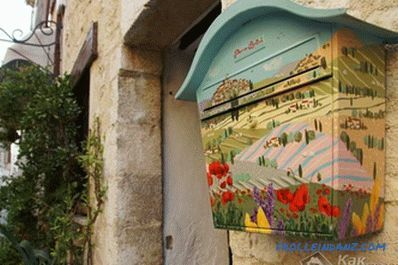 The category of original mailboxes should include projects and finished products that They are exclusively designer creative solutions. In any of them you can find out most of the household items that went through reincarnation. The easiest option is to make mail for a private house from plastic or lumber. But if you want to make a model of metal sheets will need skills and welding machine. However, it is he who is the most durable and durable. In fact, the upcoming process is quite simple and everyone, if desired, will be able to make a beautiful mailbox with his own hands. In order for the result to exceed expectations, you should still adhere to some recommendations. 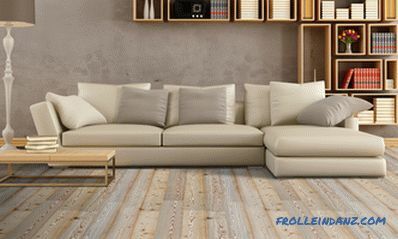 When choosing lumber, the corners are chosen as side fasteners, which will give additional strength, in addition, if necessary, you can simply carry out the restoration. The correspondence slot, located at the top, needs additional protection from precipitation, made in the form of a special protective visor. The door for removing the letters is most conveniently located downstairs, it is better if it is folding. 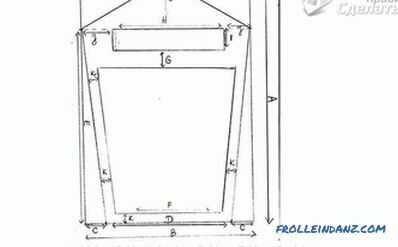 If the door is located on the front panel, then it is necessary to accurately calculate that during operation there are no cracks and cracks. 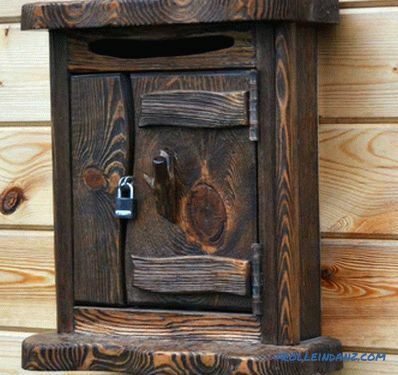 The safety of all letters and newspapers will provide a small but durable lock for the mailbox. The key is best attached to a common bunch. In order to protect yourself from a large amount of paper advertising that is uninteresting to the owners, it is recommended to make an additional table next to the post. Do you want to always be aware of new arrivals letters? You can make homemade alarms in the drawer, which will signal that a fresh press has arrived.For its manufacture you will need only a sheet of thin plywood, a few wires, a battery, a light bulb and contact plates. 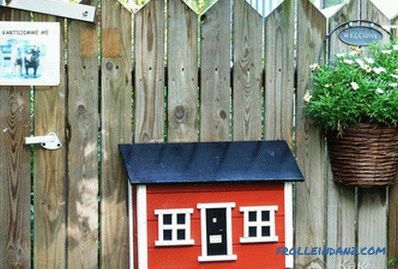 You can emphasize the fence of a house made of artificial stone with a mailbox of the same style and direction. Stick to the same color range for a harmonious ensemble. The plot far from the city, in the village, means registration in the style of Provence or Country, therefore it is better to make a box of wood. 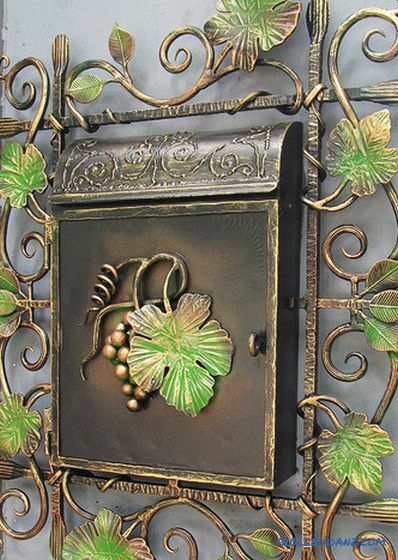 On the forged fence that encloses the territory of a private house, it would be appropriate to place a metal mailbox with wrought iron elements. They must repeat the pattern on the span or gate. 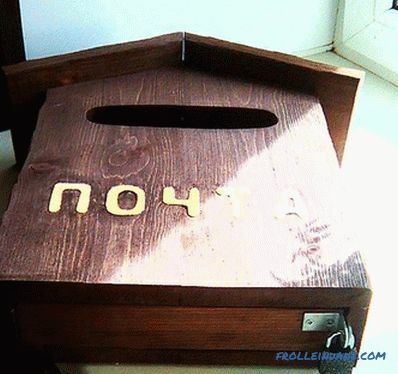 For a small dacha sector, you can pick up an original idea: a box for correspondence, which is made of improvised means. 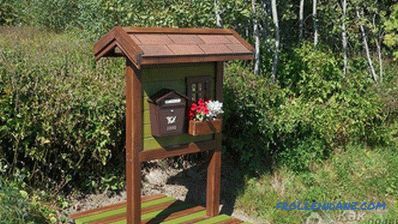 Here are some common examples of mailbox manufacturing that any craftsman can implement. The action algorithm is simple, so there should be no difficulties in the process. The beam is cut into three 33 cm long pieces. Three lines are drawn on one beam: the center line and two cross lines (the distance between them should be 30 cm). With the help of the patterns draw a smooth curve. Hacksaw along the line make the cut, and clean the edge. With the help of similar actions process the remaining two bars. The prepared elements are glued together. 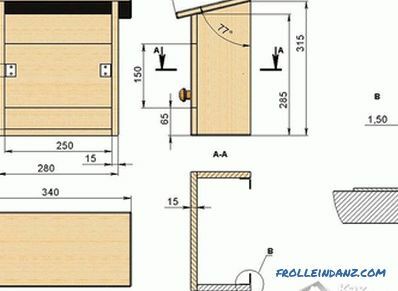 A sheet of plywood is cut into pieces according to the scheme below. 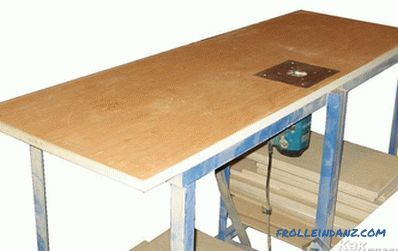 The veneer sheet is cut into eight sheets measuring 32 * 16 cm. The finished elements are alternately placed on the concave section of the block, and each is smeared with a layer of epoxy glue. 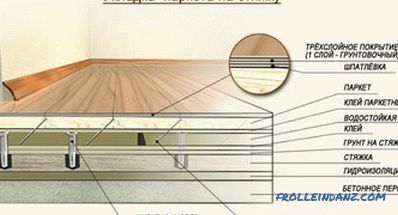 The first layer on a pine block is placed a sheet of newspaper, and then - sheets of veneer. It is important to check whether all the elements are the same in size and that there are no slots. When the glue is completely dry, the prepared cover is ground and adjusted to the size of the front and back wall. The hacksaw cuts a slot for the post and an opening for the door on the front wall. The width of the door is fixed to the loop with screws. A place is selected under the lock slot and a keyhole is cut. The cover is fixed using glue, to which colloidal silica is added. The door is installed, and the entire structure is completely cleaned with emery paper. The finished box is varnished or painted, the house number is set, and after complete drying it is fixed on the fence. Special decoupage napkins and acrylic paints are purchased for the decor: white, black and silver colors. 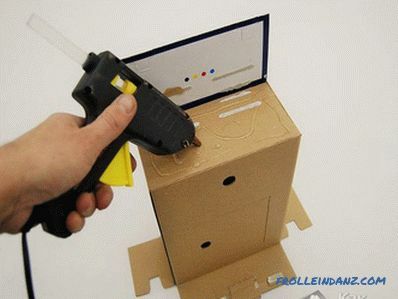 According to a pre-prepared pattern cut out all the necessary parts with a stationery knife. Pay attention to the detail with a window: it is important not to cut the cardboard to the end. This will prevent breaks. Folds are fixed with paper tape. The prepared parts are glued together with white glue and left to leave the finished structure to dry. When the mailbox is dry, you can proceed to the design: in order to achieve the effect of antiquity, all external elements are pasted over with napkins and covered with black and white paint. The corners are trimmed in silver. 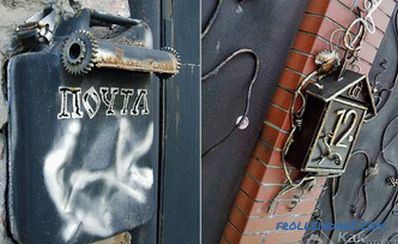 Install a miniature lock on the door and complete the decoration with drawings carved from decoupage napkins. The cover is made out by lace. All decoration elements should be well combined and in harmony between yourself, so you should immediately compare them. As already mentioned in the section on mailbox types, each type is set differently.If you are undecided, then it is worth considering all the installation options. Consider the example of several options for fixing simple mailboxes. Installation of the box Fence. To do this, the back of the mail make two cuts. Next, using metal clamps or thick wire hold fastening. It is very important at this stage to align the box. Gates. 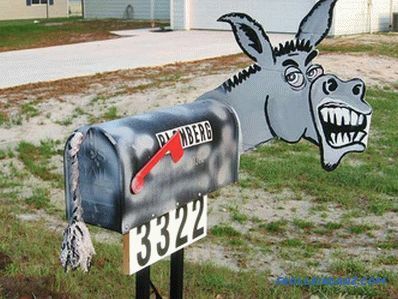 It is not uncommon to find a mailbox attached directly to the gate of metal or wood. Here you also need to pre-make holes in the back panel and on the gate. As fasteners use nuts and bolts. Wall mounting. 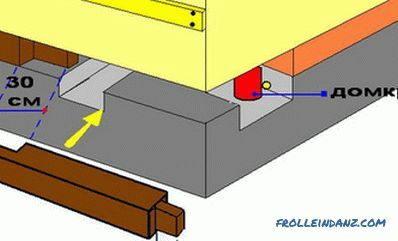 As in the two previous methods, holes should be made both on the wall of the mailbox and on the wall. They fix the structure with small anchors or dowels - everything will depend on the thickness and appearance of the wall surface. 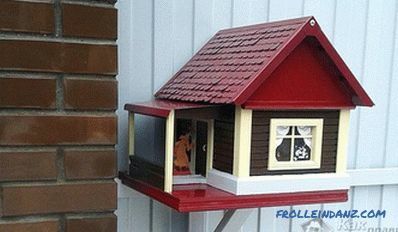 If we are talking about a separate mailbox, then it will be quite simple to fix it: you need a platform crowned with a pole. 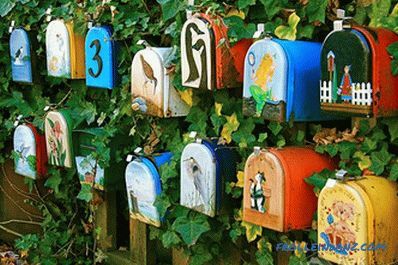 In conclusion, I would like to note that when there is free time , the necessary material and imagination can make the original mailbox, a duplicate of which will not be in the world. This element will complement the landscape design and put the final point in the decoration of the fence.